Choose from a selection of 17 holiday rentals in Fivizzano. Use the search form to the left to filter the results and pick your choice of self catering accommodation in Fivizzano. We have a good selection of holiday apartments in Fivizzano perfect for family, single, romantic and group holidays. You may prefer to take a look at our listed holiday villas in Fivizzano or holiday apartments in Fivizzano. Find your holiday homes by a specific type using the property type drop down in the filter. Filter the holiday homes in Fivizzano by a specific area using the area list above. Independent and panoramic holiday home in the hamlet Spicciano, in the green hills of Lunigiana. The house has been tastefully restored. A beautiful enclosed garden is at guests' disposal. Pleasant holiday apartment on the ground floor of a residence surrounded by about 3000 m2 of grounds with views across the valley. This holiday apartment is located in Monzone (Massa Carrara) ' a small village in the hilly region of Lunigiana, between the regions Tuscany and Liguria, and along the Via Francigena. Holiday apartments in a sunny position in the immediate vicinity of Fivizzano (5 km), located on a farm which also produces an optimal wine. Independent holiday home made of stone, obtained from the renovation of an ancient mill, in a small village near Fivizzano, in the Lunigiana area in North Tuscany. This charming holiday home with private pool, Jacuzzi and sauna lies less than 40 km from the sea and the beaches of Lerici, much loved by the English poets Byron and Shelley. Pleasant holiday apartment on the ground floor of a residence surrounded by about 3000 m2 of grounds with views across the valley. The apartment is reached by descending 13 steps. Apartment with separate entrance and a large outdoor area with pool, located on the ground floor of a two family house. 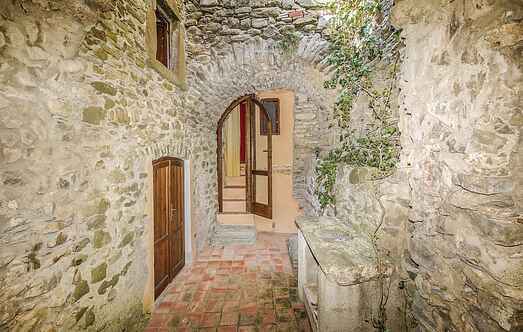 The house has been renovated, situated in a medieval village in Lunigiana.